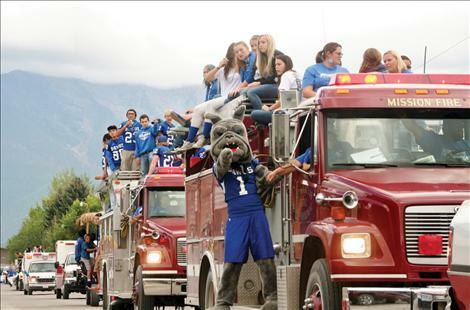 Little Bulldogs ride in the homecoming parade. 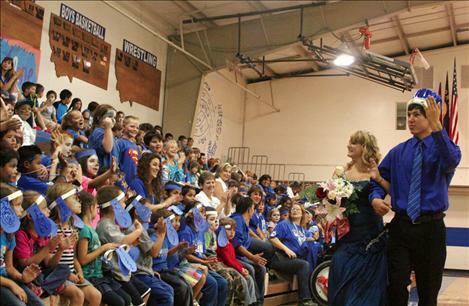 Homecoming Queen Courtney Heath and King Raymond Matt walk the gym after being crowned. Mission High School football players parade through St. Ignatius Friday afternoon, a day before their homecoming game. ST. IGNATIUS – Mission students kept school pride despite a glitch in homecoming plans. Halfway through the week, work on skits and floats centered around Friday night’s football game came to a halt after Plains canceled due to a lack of players. Many students were upset. The Freshman class really wanted to put a doghouse on a horse — the Plains district mascot is a horseman — for their Wizard of Oz themed float, but the horses were spared and the Glacier Wolfpack was brought in, so the Freshman adjusted and put a doghouse on a wolf. Homecoming week started out with the usual dress up days to show school spirit. 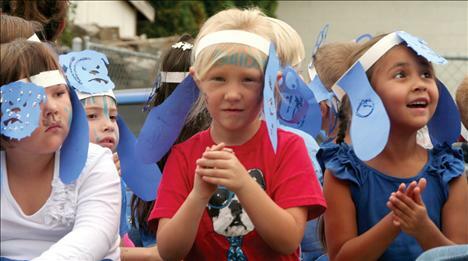 On animal day, Tate Weingart dressed up as a shark and Kaleb Durglo was a lion. Many wrapped up in their bed sheets on toga day. Elementary students could be seen wearing colorful or mismatched socks on crazy sock day. athletes in football, volleyball and cross-country. 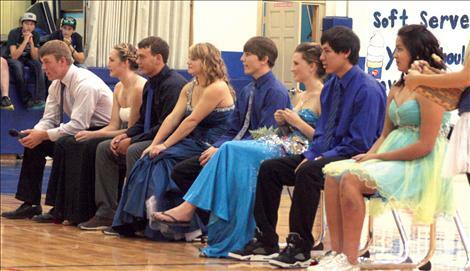 The cheering continued as homecoming king and queen candidates took center stage. The lineup included Will Powell, Auxie Cates, Nyqolas Gillingham, Courtney Heath, Jamie Mullins, Lindsay Johnson, Raymond Matt and Emilie Charlo. After asking the candidates a slew of questions, students voted Raymond Matt to be the king and Courtney Heath as the queen. The school’s royalty took a lap around the gym before going outside to be in the parade lead by the Mission Valley Honor Guard followed by sports teams, elementary classes and high school floats.